In their marketing materials AMD is heavily pushing overclocking, and they have good reason to. With the 7970 we’ve established that Tahiti has quite a bit of overclocking headroom, and as the 7950 is clocked lower by default this opens up that headroom even further. 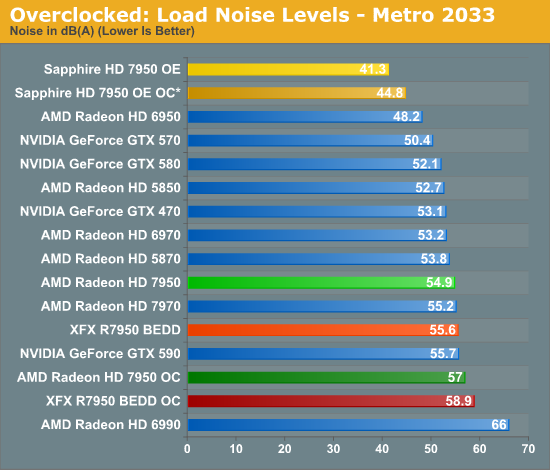 Realistically AMD’s binning process means that the best clocking Tahiti GPUs are going to be allocated to the 7970 unless they have failed shaders, but even with that there’s quite a bit of potential on paper. As with overclocking the 7970, our goal overclocking the 7950 is to see how much you can get for free; that is without any voltage adjustments. AMD’s reference PCBs are not particularly overbuilt for overclocking—cards like that will come later—so sticking to the reference voltage is the safest option, not to mention the easiest. With the 7970 we were able to get 200MHz (22%) overclocks without any voltage adjustment, and we’re hoping for the same out of the 7950. 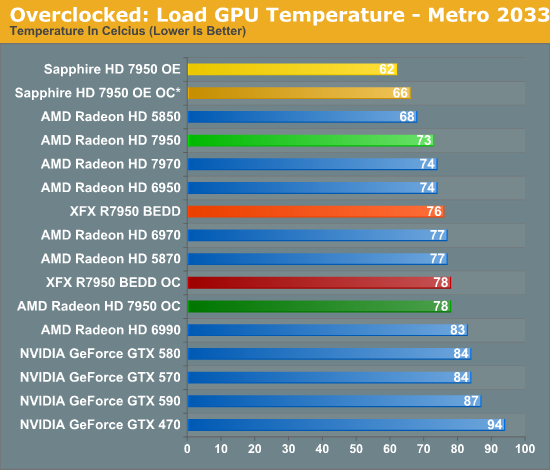 With that said, we quickly ran into a wall on one card: the Sapphire 7950. Sapphire’s low VID of 0.993v may be great for temperature and noise at stock, but it’s not doing overclocking any favors. We only hit 950MHz at that voltage. As the Sapphire was the odd man out—every other card was at 1.093v—we did end up overvolting the Sapphire to 1.093v to see what it was capable of when put on similar footing as the rest of our cards. After bringing up the voltage of our Sapphire card, all of our 7950s ended up overclocking to very similar levels. Our Sapphire and AMD cards topped out at 1025MHz core, a 225MHz (28%) overclock over a stock 7950 and a 125MHz (14%) overclock over the Sapphire’s factory overclock, while our XFX card reached 1050MHz, a 150MHz (17%) overclock beyond XFX’s factory overclock. Meanwhile the memory clocks on all of our cards topped out at 5.8GHz, beyond which we’d start seeing performance regressions from error correction on the memory bus. 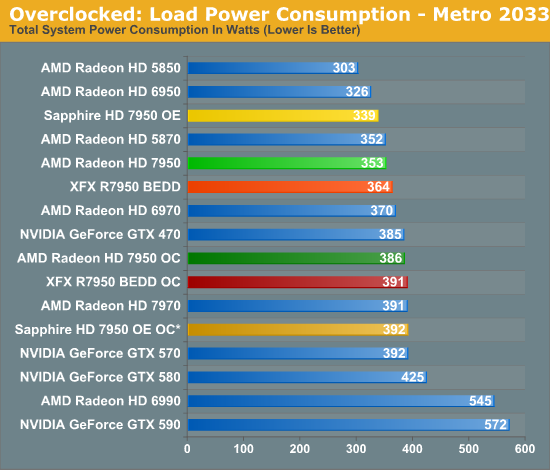 As you can imagine, with such similar overclocks, gaming performance on all 4 cards ended up being very similar. So we’ll get to gaming performance in a minute, while we’ll start with power, temperature, & noise. Even though we’re not increasing the voltage on our AMD and XFX cards, merely overclocking them and raising the PowerTune limit to avoid throttling does drive the power consumption up. 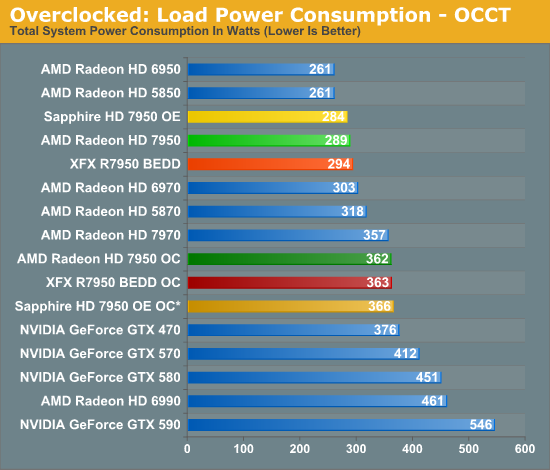 As is typical with heavily overclocked cards, overclocking quickly drives up power consumption and the 7950s are no exception. After overclocking power consumption is almost identical to the stock 7970, so while you can get 7970 performance you still need to pay the price with 7970 power consumption. Meanwhile it’s interesting to note that even with the extra 0.1v we’ve given the Sapphire card its final power consumption is only ever so slightly higher than the other 7950s, proving that voltage is the great equalizer in this case. With the increase in power comes an increase in temperatures. 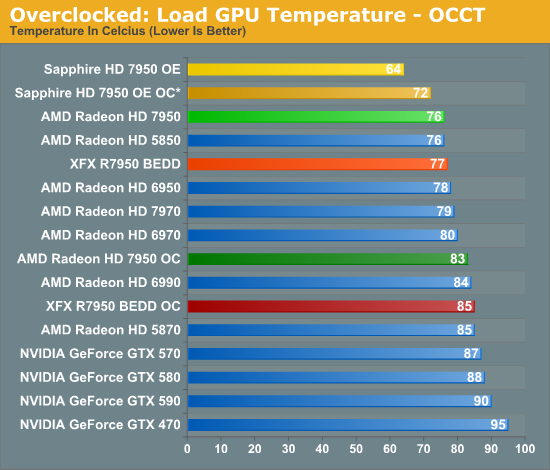 The Sapphire card still does very well here staying in the low 70s even under OCCT, while the reference and XFX cards hit the high 70s under Metro and mid 80s under OCCT. As we’ve yet to really ascertain what the thermal limits are for Tahiti, it’s not clear whether there’s too much thermal headroom left for the GPU, particularly under OCCT. Last but not least we have load noise. 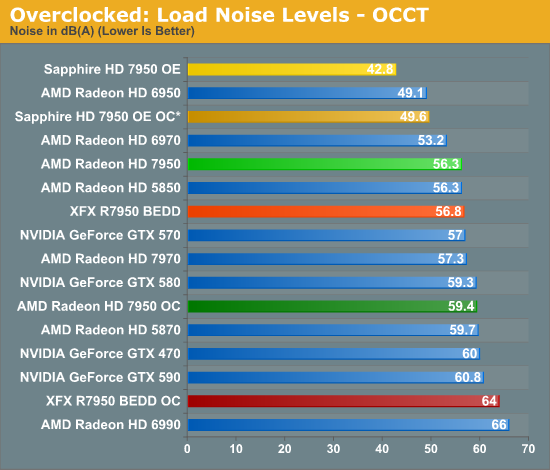 The Sapphire card is once more a stellar performer, and we still can’t get it above 50dB even with OCCT. Unfortunately the XFX 7950 BEDD has its biggest fallout yet—it may be able to overclock well, but at 64dB under OCCT the performance isn’t going to be worth the immense amount of noise it creates to move enough air to keep the GPU cool. And that's why AMD's pricing of these parts fails. With the 7950 it all comes into focus and if it wasn't clear before, it will become crystal once Kepler drives the nail home when it launches at its expected prices and performance levels. What's left for AMD to launch? A 7870 that's as fast as the 6970 but costs $50 more? A 7850 that's as fast as the 6950 but costs $75 more? Do we really think Nvidia is going to launch a 580 equivalent at 28nm and price it at $450? See how it all comes into focus? 1) I believe you mean "consistently faster than last-gen performance for the same price", which is how it will remain until NVIDIA gets a card out that can compete. 1) Well the good news is Nvidia decided to compete over a year ago when they launched the GTX 580. At these prices AMD has set, Nvidia is still amazingly competing with their 14 month old last-gen parts. Really there is no reason to get a nvidia card right now, with the gtx580 and its continuing high costs not even able to hold its own again even a 7950. Once the 7xx series launches I can see AMD launching the hd89xx series no to long after with XDR2 memory and higher clocked cores. Thing is games are designed with consoles in mind and with next gen console hardware rumors to be around the level of 6670 GPUs, why would anyone upgrade anymore, unless they intend to be running multiple screens. I personally run GTX 580 SLI. I think i personally wont be upgrading until i see a game that actually stresses my system in eyefinity settings. I agree. Even my 5850 hasn't stressed much in recent games...and I bought it for 280 USD a couple years ago. I used to buy nvidia cards, but haven't since the 5000 series, and it looks to continue this way.